Three motions were discussed in court today: Brian Jacob Church’s motion to suppress his post-arrest statement to the police, the NATO 3’s joint motion to dismiss the arson charges, and Brent Betterly’s motion to dismiss all his charges due false testimony to the grand jury violating his right to due process. Additionally, the defense team requested that the trial date be pushed back from September 16th of this year to mid-March of next year because the State’s delays in handing over discovery, massive amounts of discovery they have already handed over, and lingering pre-trial matters require more time to deal with before they can be prepared for trial. A few discovery issues were also discussed and the next status hearing was set for Tuesday, July 23rd at 2pm. The State reported to the judge that they had filed a motion regarding the protective order on police officers’ cell phones and also mentioned a conversation with an informant in the jail being tendered in discovery. Additionally, the fingerprint analysis and handwriting exemplars were both being analyzed and they hoped to have those results back from the labs by the next court date. They also expected to have information from the FBI’s Regional Computer Forensic Laboratory (RCFL) by then. Regarding information about the First Amendment investigation materials (which the judge previously ordered were all to be under seal), the State said they wanted an in camera review by the judge of some new material because not even they knew what was in it. The judge expressed surprise that the prosecutors would not know what the material was but agreed to review it. The defense also filed an affidavit under seal to support their proffer for their motion to compel discovery about the searches of other apartments in the same building as the apartment in which Church and Chase were arrested. Church’s motion is to suppress the post-arrest statement he made to the police so it cannot be used against him at trial. At the previous status hearing, the defense argued that if the prosecution wants to use this statement to impeach Church if he takes the stand in his own defense at trial, then an evidentiary hearing on it must be had since they believe it should be deemed inadmissible since his lengthy detainment overcame his will and he was forced to make the statement. The evidentiary hearing will be unnecessary if the prosecution decides they do not want to use the statement at all. As they said at the previous status update, the prosecution argued that they could not make a decision on whether they would possibly use the post-arrest statement to impeach Church if he were to testify until they know whether he plans to testify. The defense asserted that the State said they would have an answer and be ready to proceed today and that they did not want to wait until Church took the stand, if he decided to, to resolve this issue. The judge also exclaimed that he thought this issue would be argued in court today and did not expect there to be further delays on this matter. The judge then said he hoped the attorneys could work this out by the next status hearing. The defense filed a motion to dismiss the arson charges because they do not specify the alleged object of the arson attempt, solicitation, and conspiracy and because they do not guard against the defendants being re-indicted for the same allegations if they are acquitted at trial (i.e., double jeopardy). The charges are: (Count 7) conspiracy to commit arson, (Count 8) solicitation to commit arson, and (Count 9) attempt arson. The defense argued that the indictment must state the nature and cause of the charges so the defendants could prepare an adequate defense and prevent future prosecution for the same alleged offenses. The defense also stated that both the defense and the prosecution agreed that indictments must do this and that insufficient indictments cannot be cured by a Bill of Particulars providing more information. Regarding the indictment for the NATO 3, the defense argued that it did not specify the alleged object of the arson, whether this object was real or personal property, and what the value of this object is. These elements need to be specified for the indictment to be sufficient and case law supports this. Further, the defense argued, the Bill of Particulars can only add information to help the defendants prepare their defense, it cannot be the document they go to trial on because that will not prevent double jeopardy. The judge grilled the defense on a number of issues. He asserted that he had told the State that he would hold them to their Bill of Particulars and not tolerate them charging the alleged offenses in different ways. He also questioned how he was supposed to pick and choose which elements of the alleged offenses needed to be specified in the indictment and which did not for the indictment to be considered sufficient. Further, he asked whether the alleged purpose and intent had to be spelled out for the solicitation charge (Count 8), since that offense is just about asking that a crime be committed, not actually committing the crime. He referred to drug cases and a Supreme Court ruling within the last three months saying that drugs did not have to be possessed or recovered in drug solicitation cases for those charges to be valid. For Count 9, he asked if the indictment would have to list the alleged substantial step taken to attempt arson or if having that in the Bill of Particulars was legally sufficient. When the judge asked what the defense stood to gain by this motion since the State could re-indict with a specific target of the arson, the defense argued that they could not predict what the state would do in the future but that an indictment with an object of the arson specified would be a sufficient indictment and would enable them to prepare their defense. The defense also pointed to problems with what was presented to the Grand Jury to secure the indictments on these charges, as the Second Amended Bill of Particulars (filed on March 27, 2013) lists more information than what the Grand Jury transcript shows was presented to the Grand Jury. The transcript shows that the Grand Jury was told that the defendants conspired to use Molotov cocktails against police officers, but this is not indicative of arson because the object of arson must be real or personal property. Additionally, the Bill of Particulars mentions several places discussed as potential targets, including four police stations, a Chase bank, and the Mayor’s house but the transcript does not show any of these locations being presented to the Grand Jury. Thus, the defendants are being put in the position of going to trial on all these allegations in the Bill of Particulars when these were not provided to the Grand Jury to get the indictments in the first place. The State then argued against the motion to dismiss the arson charges. The prosecutor asserted that the information presented to the Grand Jury, in its totality, was sufficient for them to present a True Bill and issue the indictments, and that the indictments are sufficiently specific to show the defendants the cause and nature of the charges against them. Additionally, they argued, the Bill of Particulars gives them more details to help them prepare their defense and guard against double jeopardy. When the judge asked what would prevent the State from re-indicting on the arson charges, the prosecutor replied that the Bill of Particulars would prevent that. Regarding the alleged substantial step for the attempt arson charge, they argued that creating Molotov cocktails was the substantial step. Thus, the prosecution argued, the defense was trying to pick and choose the elements of the charges they want to see in the indictment, but the law only requires the State to present indictments that inform the defendants of the nature and cause of the charges against them and guard against double jeopardy. The judge also grilled the prosecution about a number of issues. Regarding the Grand Jury transcript, he demanded to know where in the transcript it showed that the Grand Jury had been told of a specific target. The State pointed to page 12, line 4 of the transcript, where a passage began that included questions to the testifying officer about statements the defendants are alleged to have made about using cut up bandannas as wicks for Molotov cocktails and about Church asking the undercovers if they were ready to see a cop on fire. The judge stated that that passage pointed to a charge of possession of an incendiary device and possibly other charges, but not to arson. The State then argued that the defendants had created the Molotovs for a purpose and that talking about a police station down the street was sufficient for the Grand Jury to issue a valid indictment. The judge expressed doubt about whether the information presented to the Grand Jury was sufficient and whether the indictment gave enough notice of the nature and cause of the charges. Citing the Illinois Uniform Complaint Book several times, which cites legislative history and case law to show why complaints need to be made in particular ways, the judge stated that the indictments on the arson charges appeared woefully inadequate. The judge also referred to People v. Field, a ruling that says that conspiracy charges are only valid if there is an agreement to commit a criminal act with a specific intent to do so. If the object of the arson is not specified, the judge asked, how can the specific intent be known? The State replied that they had been sufficiently specific in all their charges. At the conclusion of these arguments, the judge said he would take the motion under advisement and issue his ruling within two weeks. Previously, Brent’s attorneys had filed a motion to dismiss his charges since the officer testifying to the Grand Jury had presented false testimony about the evidence against him to secure the indictments against him. One of his attorneys reminded the court that this motion was narrow in scope, only addressing the information presented to the Grand Jury and not conceding any of the allegations against Betterly, as he is still pleading not guilty to all charges. The defense stated that an officer with Field Investigative Team 7150 was the only witness to give testimony to the Grand Jury and that this testimony was false, misleading and potentially perjured. Additionally, the State has admitted that the majority of the statements made by this officer about Betterly were false (e.g., he never met with the undercovers on May 1st, never did reconnaissance work, never planned escape routes). The misinformation was not semantics or minor details, but go to the heart of the charges against Betterly. In particular, this misinformation was given to secure a terrorism indictment against him and now the State has admitted that this information was false. This false testimony is a violation of his right to due process and the court can dismiss the indictment with prejudice as a remedy for this violation. Additionally, the issue with this indictment is a public policy one because the Grand Jury is supposed to play an independent role and presenting false testimony to them to secure indictments is an abuse of this system and should not be tolerated. The judge challenged the defense on a number of legal points. Concerning the conspiracy charge, the judge asserted, the officer was speaking to the Grand Jury about the group alleged to have engaged in a conspiracy, so she did not have to speak about each defendant doing each thing. 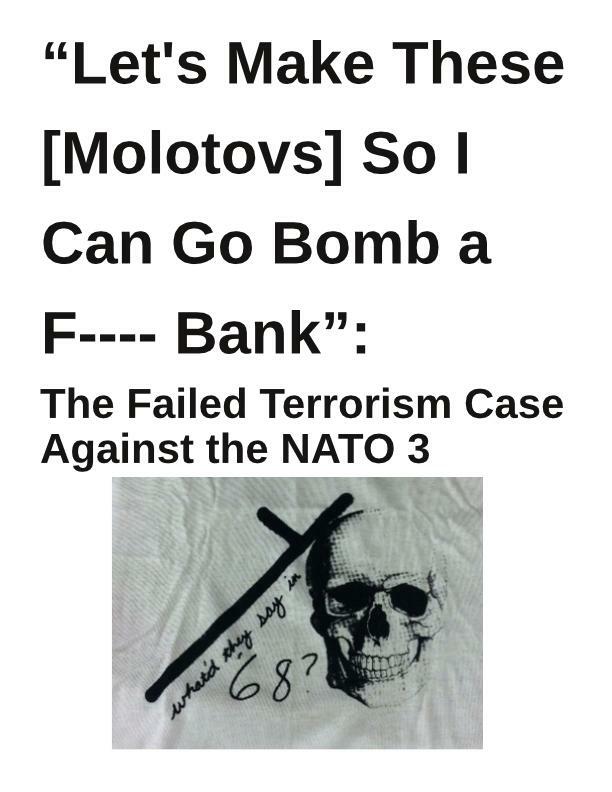 In Betterly’s case, if he spoke about how to make a good Molotov cocktail while people were creating Molotovs and discussing where to use them, then he was “in for a penny, in for a pound.” Similarly, the judge said, the officer thought Betterly was part of the “Church-Chase-Betterly group or gang,” to whether that is true or not depends on the weight of the evidence, which is a trial issue for the jury to consider. The judge also said he could not hold a mini-trial for the testifying officer to see if she had committed perjury. To this, the defense stated that the investigative reports directly contradict the officer’s testimony and this is clear, so no mini-trial would be necessary to approve the motion and dismiss the charges. The judge also said that the defense’s arguments seemed to point to the allegations not being sufficient to convince a jury to convict and that this motion was really a premature motion for a directed verdict (a motion the defense can file after the prosecution presents its case against the defendants to ask the judge to find the defendants not guilty and throw out the charges). The State then argued their perspective, starting with asserting that they had not admitted any false testimony being given to the Grand Jury. Additionally, they charged the defendants as co-conspirators, so each defendant is legally responsible for their co-defendants’ actions. During the Grand Jury testimony, the officer talked about the group as a whole and then each defendant individually. There was plenty of evidence that they were a group, as they traveled together, were living together in the same place in Bridgeport, and traveled with a guitar case full of weapons. The Grand Jury was also presented with sufficient information about Betterly specifically to show that he was affiliated with his co-defendants and gave them instructions on how to create good Molotov cocktails while they were discussing what to do with them. Thus, it is disingenuous of the defense to suggest that the Grand Jury returned a true bill wrongfully. The State also argued that the defense lost its argument on two grounds: first, there was no false testimony; and second, the totality of the information presented to the Grand Jury shows that Betterly was not prejudiced and his right to due process was not violated. The judge challenged the prosecution as well. He expressed that he felt that the information presented to the Grand Jury was weak and assumed that there was more to the charges, to which the State responded that there was more detail in the Bill of Particulars. He also asked if simply giving information on how to construct good Molotov cocktails was sufficient to issue the indictments, as there is information online about how to do this and he was not sure whether that was protected speech or illegal as a rule. As a final statement, the defense argued that the Grand Jury was given misleading information about the three defendants being in a group for a criminal purpose, as they were just friends. The defense also pointed to the State’s argument that the presence of Molotov cocktails is a sufficient basis for all these charges as indicative of the problem with this whole case—the State’s complete misunderstanding of the law. After hearing these arguments, the judge stated that he had considered them and reviewed the case law. He said that he believed there was sufficient information presented to the Grand Jury for their purposes and that there was an affiliation for an illegal purpose. If there was misinformation, he said, it was not of such a character that the Grand Jury would not have indicted. Thus, he denied the motion.